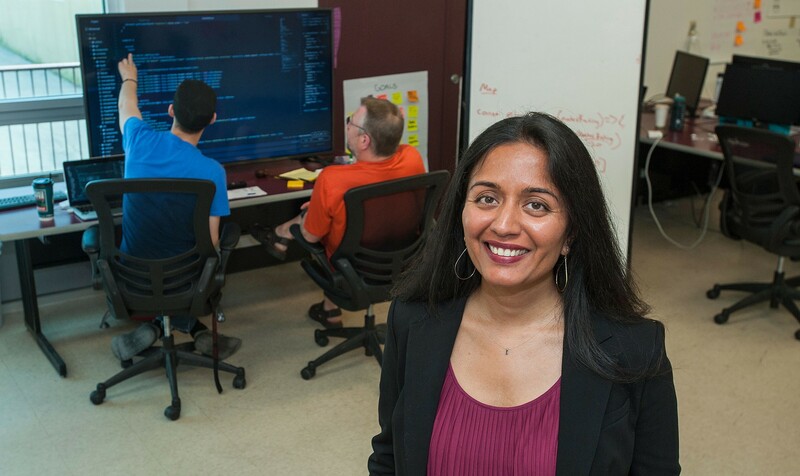 Amita Patel Greer leads the Montana Code School, which has produced 75 graduates for the state’s tech sector since 2015. Even the best, most accomplished, longest-tenured web developer doesn’t know all there is to know about coding. The sheer volume of the internet is too great and the number of obscure issues too many for any one person to have all the answers. But great developers know how to think like coders — always learning, always seeking new solutions, and always ready to fail in their experimentation and then rebound to outflank a problem from another angle. The Montana Code School at UM plunges would-be developers into a three-month course that demands not only 9-to-5 commitment in the classroom but another 20-plus hours of coding a week in students’ “off” hours. The intensity is by design: Students not only are attempting to master a new language — they’re wrestling with a new way to approach the world. Since its founding in 2015, the code school has graduated 75 students and sent 95 percent of them into the workforce — a placement rate that resonates with potential students and has an impact across the state. Employers ranging from tech companies like Bozeman’s Wisetail and Missoula’s Submittable to more “traditional” companies such as Partners Creative advertising agency and Livingston’s Printing for Less have hired students from the school, keeping homegrown talent in Montana. Making the choice to leave a career or put one on hold to go back to school full time is tough. But unlike hopping into a more traditional postsecondary environment, Montana Code School offers a unique path toward a different future. Still, total commitment is required. Committed, yes, but students don’t normally enter with much experience. In fact, backgrounds run the gamut into some decidedly non-techy skill sets. Jesse Sindler, 28, who graduated from Montana Code School in 2016, first heard about the program from a seatmate on a flight, and it struck a chord as a possible path forward from his job as a bike mechanic. Motivated and creative classmates are important, as the school’s approach to teaching is less of a traditional syllabus and more of a “move fast and break things”-style ethos, adhering to “agile” learning that allows tweaking as they go. 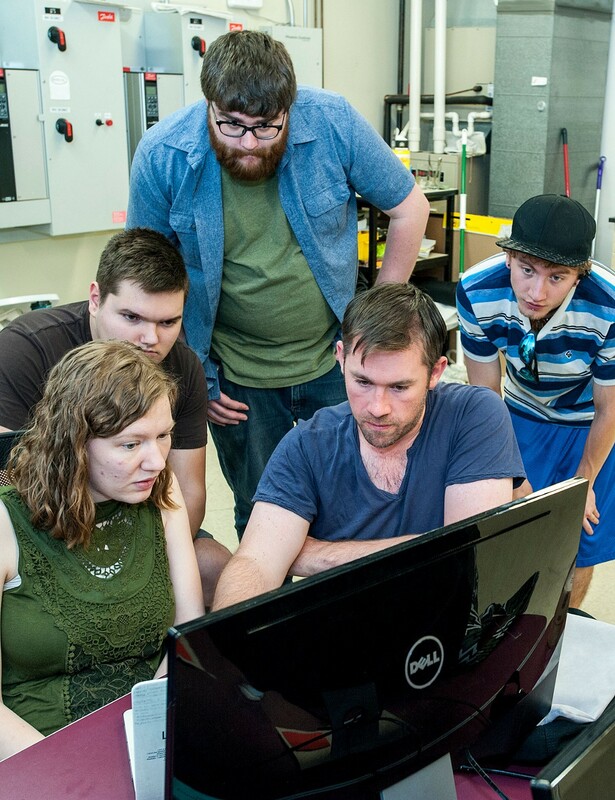 Not only are students working in small groups on specific projects day in and day out, they’re working with their instructors to guide content and teaching style as the three-month course progresses. At the end of each week, the class analyzes what worked well and what didn’t and makes decisions as a group on how to adjust the content and delivery. Sindler, who landed a job in Missoula with Partners Creative as a web developer, says what he learned, how he learned it and his pre-code school background mixed to build a well-rounded potential employee. Code School instructor Nathan Smith (lower right) assists a recent cohort of students at the MonTEC business incubator. Housed in the MonTEC business incubator building across the Clark Fork River from the main UM campus, Montana Code School enjoys a unique relationship compared to many similar programs around the country. The code school is a nonprofit organization — technically housed under MonTEC’s 501c3 status — and also enjoys UM affiliation via MonTEC’s connection to the University. It might not seem that unusual, but code schools are still such a new concept — the first one in the U.S. was founded just a few years ago — that they remain unregulated and without a means for any type of accreditation. Lacking more formal quality control, programs like Montana Code School promote their job placement rates, community of coders and curriculum to attract students. But in a crowded marketplace, an affiliation with a respected public university lends credibility. Most Montana Code School students are in their late 20s and early 30s, Greer says, and looking for a career change and a chance to break into the tech sector. They also, nearly without exception, want to stay in Montana — a boon for employers in the state who might not have the resources to woo Silicon Valley stars to Big Sky Country. And as Montana’s tech sector grows, there are more opportunities than ever for students to launch new careers while enjoying the state’s lifestyle. However, no coder is ever a finished product, and no matter how intense, three months at the code school isn’t enough to make someone into a full-fledged developer. And as subsequent cohorts of Montana Code School graduates hit the job market and find their place in the Big Sky tech world, alumni and supporting companies expand into more than simply a pipeline of coders, but a vibrant tech community across the state. That community, in turn, will help ensure that the Montana Code School continues offering opportunities to students looking for a big change. The University of Montana is located in the heart of the Rocky Mountains in Missoula. Visit www.umt.edu for more information.